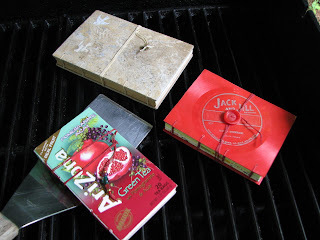 Bookbinding Etsy Street Team: Virtual BBQ Starts Tomorrow! Mmm, smell that smoke! Who doesn't enjoy a great barbecue? The food and fun are one of the best parts of summer. Well, here's your chance to enjoy some summer fun with less fuss and no calories! The Bookbinding Etsy Street Team invites you to join us for a virtual BBQ scavenger hunt this weekend. One happy player will receive a $30 gift certificate to spend in participating shops. 2. While you're shopping, look for a picture of one of these BBQ items hidden within the first 10 listings of each shop. Be sure to make a note of which item you find where! 3. When you've found them all, contact UsefulBooks via the Etsy contact feature or send an email to useful.books@yahoo.com and let us know which item you found in each shop. In other words, match the item to the shop. Find all 18 items, and you're entered to win! 4. You will also receive one chance to win for each item you purchase from participating shops during the event. Just include the word "BBQ" in your message to the seller when you buy. 5. Purchases and entries must be completed by midnight Eastern Standard Time on Monday, August 3, to qualify to win. The winner will be notified on Wednesday, August 5, and announced here on the blog. It's that easy! So throw another book on the barby, and have fun with us this weekend!